I want to weld at home. Where do I start? What do I need? In this one-hour introduction to welding and metalwork, we will discuss the basics of metalwork, including what you need to get started. How the different tools work and how to set up your own small metal shop. Attendees will gain valuable insights into the tools they need to learn how to weld and get their own small metal shop set-up. Participants will try their hand at MIG welding and make their own sturdy steel hook to take home. 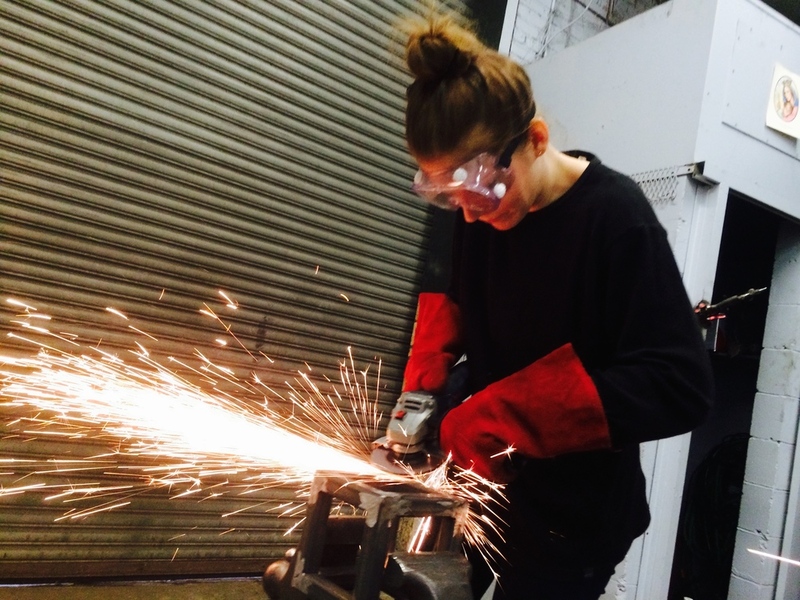 This is where to learn to weld in NYC. Classes are limited. Saturdays at 9:30 AM and 4:15 PM. Pre-registration is required. Click on button below for available dates and to register. Through the making of this small steel cube, you will learn a tremendous set of welding skills that can used to make anything in metal. Whether it is a custom dining table, a lamp or a sculpture. The essential building blocks are quickly provided in this 4 hour long class that is purely focused on rapid learning. Participants will take a 20’ length of 1” x 1” x 1/8” steel tube and turn it into a beautiful 6” x 6” x 6” cube. The skills you will focus on learning are measuring, cutting, fitting, clamping, MIG welding, and grinding, This is our most popular class and they fill up quickly! Preregistration is required. Click on button below for available dates and to register. *If you are redeeming a gift certificate, or coupon for this class click Promotion Code on the bookings page enter the coupon code to proceed. Preregistration is required. Click on button below for available dates and to register. *If you are redeeming a gift certificate, or coupon for this class click Promotion Code on the bookings page enter the coupon code to proceed. Read more about our Steel Bowl Welding Class here. You are bringing your cube back after all of the new skills you have developed and taking it to the next level. Including an introduction to TIG welding, where you are filling the pits in your cube from your first Cube Class and then detailing the cube with a high-end finish. Your inside and outside corners will be like nobody's business. Skills will concentrate on final sanding, fast corner filing techniques and a blackened patina workshop, with a beautiful Microcrystaline wax finsh at the end. Each class is 4 hours. Tuesday evening classes are from 7:15pm to 11:15pm. Sunday classes are from 11:15am to 3:15pm. Preregistration is required and to have taken the "How to Make a Cube" class. Click on button below for available dates and to register. Create your own Steel Herb Box in this super awesome introductory TIG welding class. You will receive 4 hours of hands-on instruction and extensive practice that will give you the confidence to TIG weld on your own. This class is for the novice TIG welder who wishes to gain a firm grasp on this refined metalworking skill. Skills: Fitting, TIG welding, grinding and finishing. Now we are having so much fun! TO REGISTER - Register each boy scout as an adult. Upon scheduling, you will find pre-requisites to be completed before the class . Learn the essentials of forging and make your own bottle opener. In this two hour class you will forge a beautiful bottle opener, transforming a bar of steel into a practical and artistic tool using fire and hammer. You don't need to big a big burly brute for this, anyone over the age of 18 is more than capable. Students are required to wear jeans, cotton shirt, and leather shoes or boots. The next phase in your metalworking career! Click on button below for available dates and to register.